Rich, well-drained soil with plenty of well-rotted organic matter added. Grow in full sun up a pole support system or on a strong trellis against a long fence or wall. Hops are sensitive to day length, and produce best between 35 and 55 degree latitudes. 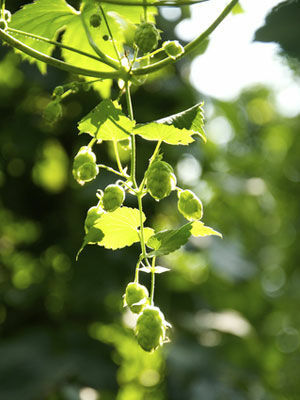 Hops are hardy perennials that require a period of winter chilling and a growing season of at least 120 days. Crimson Clover. Clover or other cover crops are usually grown between rows of trellised hops. Plant in hills in spring after the last frost has passed and the soil is warm. Hops need support and plenty of room to sprawl. They will quickly run to the top of a 20-foot vertical trellis. Some root trimming may be required to stop the rhizomes spreading too far. Hops will bear for several years before they should be replaced by younger, more vigorous vines. Harvest when cones feel papery and dry, and leave a yellow powder on your fingers when touched. Dry in a warm spot away from sunlight. Hops may develop mildew if they have inadequate air circulation. Prune vines to improve airflow.